We have purchased a piece of land in Vermontville! There will be an indoor and outdoor training facility. The facility will be a pre-engineered 175’ X 60’ steel building with a single slope roof with 25’ interior clearance. Inside the building will be multiple boxes in the floor for different set ups. In the upper front corner will be the bathrooms with two stalls and a shower in each. On top of the bathrooms will be a viewing deck. Outside, behind the building, will be three staggered runways. One runway will be a long jump pit and all runways will have a track surface. There will be two 10’ x 10’ concrete pads with structures to do drills on. There will also be a 60m warm-up track for running drills and a warm-up area. Already in the site plan we have plans for expansions. One is a 30’ x 50’ weight room expansion off the building. This space will be for workouts and possibly used for classes, such as crossfit. A second building is also shown on the site plan. This would be used for storage and/or business plans. 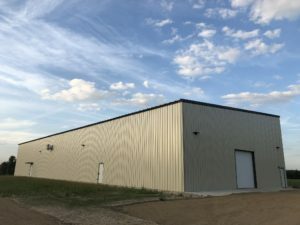 Around the current property are two plots of land we have interest in buying at a much later date, but we have already talked about uses for this land, such as expanding our team to other disciplines in track and field. Thank you! Thank you to all who have helped us make this possible and continue to make this possible!